This is the College Course version of Learn to Organize Your Neighborhood (see below). This version includes more general examples of citizen participation theory and practice. Usually six 1 ½ hour sessions. Ok, so you've got a coalition together. It seems like at least some of the right people are at the table, and you've been able to accomplish a few early successes. Now how do you grow your coalition to the next level? This workshop will explore the principles of healthy communities and the levels of working together. Recruitment and outreach strategies will be shared. Coalition building is fun work. Come learn some tricks of the trade for keeping it that way! This training will present the difference between macro- and micro- organizations (those which are made up of different agencies to influence broader societal issues, or agencies which provide services). Depending on the context, helping agencies and organizations may be introduced and categorized. Usually 1-hour. This is usually a six-week series. Each session is usually 1 ½ hours. Participants explore the basic concept of what a neighborhood or community is. The group will create their own vision of a healthy community. Different forms of community assessments are described. Participants design a survey tool and practice interviewing skills. Different styles of leadership are explored. Participants identify their own strengths as leaders and discuss ways they maintain balance in their leadership roles. Recognizing others' leadership styles is described as a tool for recruiting others to be involved. This workshop will focus on types of meetings and skills necessary to conduct an effective meeting. Participants will practice the role of an effective facilitator or group chairperson. Advance planning, agendas, and minutes will be covered. As group members comes together, defining a common vision for their community is an important early step. From there, naming the underlying issues without becoming overwhelmed by the problem is the next critical step. Learning to identify and address these issues is a fundamental organizing skill. This session explores the issues of empowerment. Power will be discussed in its various forms. Participants will discover ways to use power as a tool to organize. Course review and graduation offered only as part of the six-week series. What is a healthy community? How do we begin making our communities healthier? 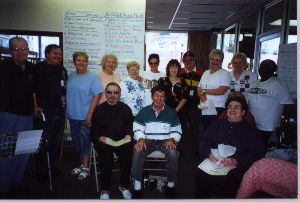 Community Development theory and examples of its practice give participants a clearer idea of how to get started organizing their communities to improve quality of life. 1-hour presentation.